And I know I’m the bagger, and I’m ready, see my reusable bags, opened and ready for me to pack in my cart? But the woman behind the counter eyes my bags suspiciously as if I’ve hidden some jars of Nutella in there that I don’t plan on paying for, and she leans over and checks to see my bags are empty, and indeed they are, but now my bags are toppled over, and with a scowl she starts plunking my heavy bottles on TOP of my bags, crushing them further to the bottom of the cart. So now my cart is full again, my bags are flattened under all the containers, and that’ll be 12 Euros, please, and I swear there’s a look of triumph in her eyes. So I pay, and roll my cart over to the window, where I unpack all of my things onto the dirty floor and start the bagging process over again. The problem may be bigger than the frumpy frau at Aldi’s. At Ikea last week, after a two-hour tour of their massive store, C and I unloaded a cart full of things that soon piled up at the end of the roomy counter. I was doing my best to bag them in the bright-blue cheery Ikea bags. C, meanwhile, looked like she was about to faint, so I sent her off to find the restroom. Out of the corner of my eye I notice that the clerk behind the counter is taking each of my three large bath towels, opening them completely, scanning them, and dumping them in a heap at the end of the counter. They were neatly folded upon arrival, but now all three are a jumble of terrycloth. The clerk tells me the total. I hand him my Visa card, but he says that’s no good, so I give him a Master Card, but again he won’t take it. “Cash only, please,” he says, and now I’m really sweating; I have 40 Euros in my wallet and 150 Euros of stuff half-bagged, and a long line of people waiting to check out behind me. “I won’t be able to pay for all of this,” I say, trying to mentally rank my pile of household goods by need, not want; keep the towels, return the bathmat… But he says, “Cash machine is on the wall, miss,” and I turn and sure enough there’s an ATM down the hall. I’m uncertain how to proceed, keep bagging and let him move on the next customer? Run to the ATM with my stuff strewn all over his counter? I ask him, but something gets lost in translation, and I thought he said he was going to check out the next person as I bag, but now I see he is just sitting on his chair watching me bag my stuff, cool as a cucumber, and the woman who is next in line is making annoying little tsk’ing sounds with her mouth. I give up on bagging and dash over to the ATM. For once the ATM is kind; it accepts my PIN, it gives me my cash, and I return to find my clerk has helpfully moved my items off the end of his counter and is checking out the next customer. Confusing, but no matter. I pay, then turn my attention back to my cart. And I see that it’s Aldi all over again. The clerk did not continue my pattern of taking items off of the counter and putting them into the bags; he has taken my bathmat and comforters and placed them on top of the bags, crushing them down, requiring a repacking job. C comes running up to me, her cheeks now a more natural color. This check-out has taken so long she couldn’t imagine I could still be here fussing at the end of the aisle. She helps me refold the towels and repack the bags. She takes one heavy bag and I take the other, and out into the rain we go. But back to Aldi. 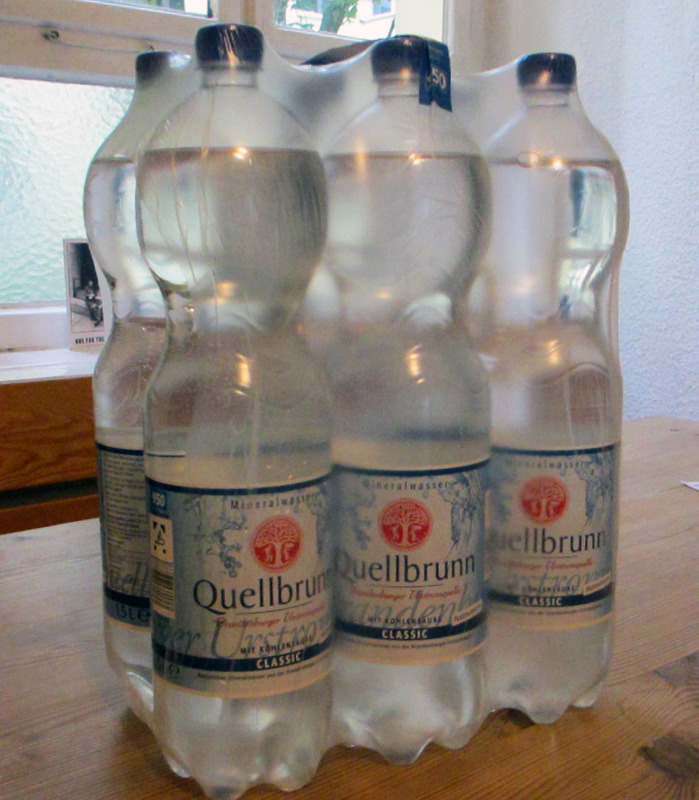 If you’ve ever been to Germany, you may have noticed that Germans have great love for fizzy water. They drink it all the time. Restaurants don’t greet you with a glass of flat ice water; they wait for your drink order and give you what you ordered. If you ask for water, it’s going to be fizzy and you’re going to pay for it. Friends have cases of it stacked in their pantry. Even the reusable water bottles we bought for the girls are made for fizzy water; they have a special valve that keeps the pressure from the bubbles from leaking out. I’ve never seen such a bottle in the states. A few weeks ago in a boat I forgot my water, and Helga gave me hers, and though it was green-yellow like Gatorade, sure enough it was mixed with fizzy water. Fizzy water is fun; it feels more sophisticated than flat water. But M and I have discovered another reason why Germans may be drinking so much of it. If you buy it at Kaiser’s, the grocery store that’s a step up from Aldi in cleanliness, selection, and checkout demeanor, you pay just 65 cents per 1.5 liter of the most common brand on the market. But get this. Aldi sells those same bottles, same size and quality, for 19 cents each. Small wonder then that everyone is shopping at Aldi and drinking fizzy water. Us included. So drink up, kids. We’ve got some shopping to do. I can’t even tell you how much I miss Rod in the checkout aisle at Kowalski’s. I’d pay extra for my sparkling water just to see his smiling face. And he does know me by name. The other day I had on eof my new exchange students come up to me and ask my why the checkouts are so small and why people always seem to rush you. I told her that the key is not to be rushed, just take you time, and to say a perfunctory “Entschudigung, bin gleich weg!” to the next person in line. The clerk might start piling his/her things up on yours, but at least that makes you learn to remember what all you put in your cart :D. The checking of bags is mandatory in some stores – no matter where you are, but you feel less like a criminal if you just show them to the clerk open – and in some stores they have mirrors overhead where they see what you have in your cart. Oh and another note on Aldi. Until about 6 years ago they did not have scanners and the cashiers knew the codes of all their items and typed them in at incredible speed. And thn they almost pushed your things off the counters that you ended up putting everything in the cart anyways and started to bag only after. Most stores around here have these table-like things that people should go to to bag their stuff though – I assume the deal is the same in Berlin, no? And as far as the fizzy water goes – admitted, we love it – but depending on the brand it also has a lot of minerals which are good for you. I would, however, not drink it when working out, that is just plain weired. And imagine it the other way around – used to cheap fizzy water and then you go stateside and you can only buy expensive perrier because all the cheap things do not exist! And if you order water in the cafe just say ‘Leitungswasser’ oder ‘Stilles Mineralwasser’ and that should get you non bubbly. And yes, you might even have to pay for regular water, that trend has started in the past few years. Highly annoying!! 😀 So far so good! I love reading the blog, seeing the perspetive the other way round!! Thanks for the tips, Heidi! Now I’m not quite clear, if I say “Entschudigung, bin gleich weg” am I being snippy or polite? I think you’re saying it’s the polite response. I do see your point about cheap fizzy water — we are going to miss this cheap stuff when we’re back home! I appreciate the words to order flat water, because every now and then, that’s what we’re looking for. As for the table-like things where people are expected to go repack their bags, I haven’t noticed them yet, but I’ll keep an eye out for them. And I hadn’t thought about all the good minerals we’re getting in the mineral water! It was all about the fizz, I thought. Live and learn!! Thanks for your reply. Thanks, pixxxel, glad to hear much of it rings true for a local as well, though you must be right about the extra 25 cents, and I’ll have to look more closely at my bill next time. (If it’s too good to be true, it probably is… I should have known!!) And good point about not expecting great service when you’re paying so little. They’re connected, for a reason. A friend emailed me: “I once heard that the cashiers have to scan a certain amount of items per minute. Oh, I just googled it, it seems to be 4000 items per hour…” The clerks are obviously under pressure, and I’ll try to cut them a little slack. In Germany it seems that the adage is: “The customer is always wrong”. I have experienced everything that you mentioned in this post: on those days I really questioned the whole decision to study in Germany. Even here Stateside, Aldi is catch if catch can. If no Manager is around, Ima put my bags into the cart open, and at least some of the cashiers will put the groceries in the bags. If the manager is around, don’t even attempt that stunt. But Ima intrigued by this bottle return scenario. So . . . a person could actually make a living drinking . . . hmm . . .
Well, I have learned a bit about pfands by now, and realize that they charge you a deposit fee in addition to the cost of the product, and then return the deposit fee later… Live and learn!